I’ve always been amazed by how quickly a place can feel like home. I tried to visually prepare for my arrival by constantly scanning the handful of photos of my apartment on my realtor’s website. I’d show them to friends who’d ooh and ahh at the blue tiled bathroom, the arches in the living room, and the stainless steel appliances in the kitchen. It all looked so great, but was it? The day I arrived–emotionally overloaded from saying goodbye to everything and everyone I love, two flights, a sweaty yet exciting arrival while meeting new colleagues, and a welcome brunch–it was finally time to pile into the little van. We left the school, oversized “brick-filled” luggage jammed into the back, and twisted and squeezed down the tiny lane of our school towards my apartment, minutes away down the hill. There was my door! Green, with glass plates and a mail slot, my main slot. I live right on the street of the school, on an ancient Roman path, just wide enough for one horse. I lugged my bags inside, learned about the alarm code, and immediately stepped into my new home. Before I left, I was really saddened to leave my old home. I had a great apartment in a fun Irish enclave in Woodlawn, the Bronx. It had two bedrooms, a deck off the back bedroom, wooden floors, was surrounded by trees (rare in the city), and was really comfortable. Packing it up and away, I kept wondering what I was doing. Now I have arrived in Italy. I entered a white-tiled entry way that was about the size of my second bedroom in the Bronx. An antique wooden hutch dotted with the owner’s yachting trophies and various knick-knacks welcomed me, while I noticed the — Gasp– walk in closet with pocket doors right in front of me. So much space, and all recently renovated. The admin gave me the key, a skeleton key!, to my apartment, showed me the alarm code, and was off to take other teachers to their apartments. Later, one teacher said, “We were talking about you when you went in. This is your door. This is your home. You LIVE here.” We were all just trying to take it in . . . the dream. Down two steps into the sunken living room, with the cool red tiles. Shutters closed tightly against the Ligurian sun, I could still feel a soft breeze enter the room, stifling in an unusual heat wave. Cozy couch, antique writing desk, shelves, exposed bricks and beams — they clearly wanted to preserve the antique charm of this centuries-old building. Alone in my new place, I explored, constantly saying “Oh my God,” over and over because it was so much better than I could even imagine. So clean. So well furnished. So neat and well-maintained. So darned cute and cozy, yet spacious. Although it is a one bedroom, I think it really is about the same size as the 2 bedroom I left at home. And . . . in Italy! Into the blue-tiled bathroom, with a rain shower, big vanity cabinet to store things, a toothbrush holder, baskets for toiletries, and actually, the previous tenant or someone had left me a bunch of products with a note: “All New For Your Convenience.” Up a stair into the kitchen, breezy with window seats facing the gardens. A little black bird cooed at me and hopped down from a tree, as if to say welcome. “Hi Sweetie!” I actually said aloud, as I walked around the kitchen, exploring my washing machine, dishwasher, and . . .oh wow, they left me 5 bottles of wine. And food and drink in the fridge, including Prosecco. There, I discovered a little hidden room in the back for storage. So many surprises in this new life. Finally, I made my way back through the living room to the bedroom. I was worried because the pictures made it seem like the bed was the size of the room, and I wouldn’t have much space — although it looked nicely furnished. No. Plenty of space! Big armoire and other charming furnishings. Tuscan gold painted wall, yachting posters and oil paintings. A walk in alcove at the side of the room and in the front, a door to the red-bricked patio. 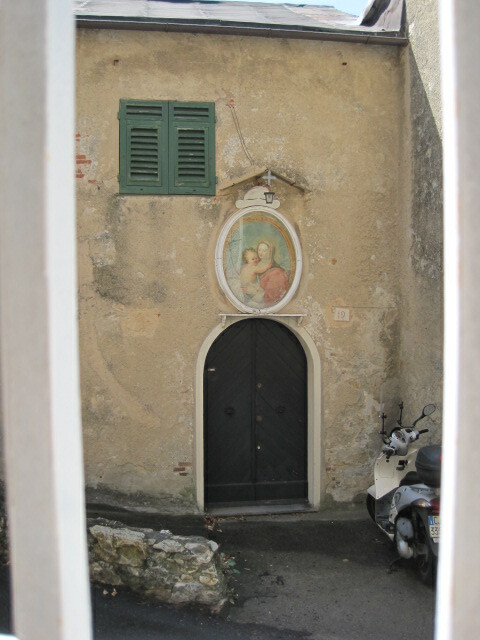 To one side, a big stone wall facing my old Roman road, with a door and a little ramp for a Vespa! To the right, the gardens and then views leading up the hill towards the main street in town. A private, lush oasis for me to relax each day. Again, better than I could have imagined. I live here. In my bedroom, I opened my window and shutters facing the street. A large, beautiful shrine of the Virgin Mary and child greeted me. Right there, as if to look over me on my new adventure. When my mother was expecting me, she prayed the rosary every day, promising that if I was healthy, she would dress me in blue for a year. Blue is now my favorite color, and to this day, whenever I pass a shrine (and there are many here in Italy) I say a little Hail Mary, thankful for my new life. “Mary is watching over you,” said my mother. Then I looked over my bed and saw a medieval style print of Mother and Child. 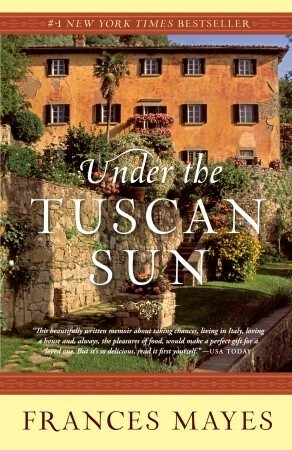 Mary is everywhere in Italy, like a friend, as Frances Mayes noted in Under the Tuscan Sun. (Yes, my inspiration for this blog title).